Nigawa Gakuin is proud to announce the arrival of the first international student from our sister school Saint Mary’s Catholic High School in Phoenix, U.S.A.
Alex’s interest in Japan was a major factor in his family’s decision to host one of our students who recently spent 10 months in Phoenix, an experience that had made him even more enthusiastic about visiting Japan. In taking advantage of the long summer break, Alex will be here for approximately 2 months during which time we are excited to help him learn more about Japan, the people and teach him some Japanese language! 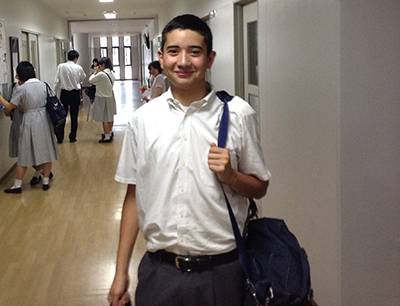 We are also looking forward to learning more about our sister school in the U.S.A. from him.